Ubisoft won't even wait a full year to release the next Assassin's Creed, because the next one, Assassin's Creed III, will be out on October 13 30. The company announced that today during a call with investors, bumping the AC series up from its traditional November release. Ubisoft boss Yves Guillemot says the game will be "the biggest launch in Ubisoft history." He said the game has been in development for three years. 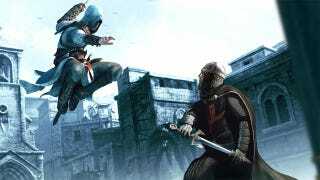 Details are scant about the new game, but Ubisoft has promised that it will star a new protagonist, giving Ezio de Auditore, hero of Assassin's Creed II, Assassin's Creed: Brotherhood, and Assassin's Creed: Revelations a rest. You can watch the end of Revelations for some hints about where ACIII might take us. Or you can just read the theories...that lead us to some likely era, everyone's favorite being the American Revolution. NOTE: We originally said the date would be October 13. But we now believe we misheard the French-accented words "October 30th". Our apologies.